Malaysia has over 660 higher education institutions and 1.2 million currently enrolled tertiary level students, creating a highly competitive job environment with skilled and educated graduates. With easier access to higher level education, expectations on the quality of the workforce is greater and a bachelor’s degree may not be enough to differentiate employees from the sea of almost 200,000 other graduates yearly. Mr. Timothy Bulow, CEO of INTI, and Dato’ Seri Idris Jusoh, Higher Education Minister talk with INTI students. Recognising and acknowledging lifelong learning as one of the key pillars of talent development, the Ministry of Higher Education (MOHE) has been pushing for flexi-education options to empower working adults to pursue a further education. Shift 3 of the Malaysia Education Blueprint 2015-2025 (Higher Education) aims to enculture and create a ‘Nation of Lifelong Learners’. One of the efforts under the Blueprint is the introduction of the Accreditation of Prior Experiential Learning (APEL), which recognizes previous experience such as work or relevant experience as qualification to enter university. Under the first phase of the APEL programme, APEL (A) or APEL (Accreditation) was introduced to allow individuals without formal education qualification but have extensive experience to access tertiary level education, be it certificates, diplomas, bachelor’s degrees or master’s degrees. The second phase, APEL (C) or APEL (Credit) allows individuals to further save time and money on their higher education by translating their experience into credits in their enrolled programmes. After the candidate has submitted a formal application for APEL (C), they will undergo a tailor-made assessment or prepare a portfolio and have their results presented to the faculty and the APEL (C) committee for final approval. The entire process takes only a month from express of interest to assessment and acceptance, with a personal advisor assigned to each candidate for guidance through the applying process. APEL (C) is currently available at four selected higher education institutions and is expected to expand to more by end of year. INTI International University & Colleges (INTI) is the first and only private higher education institution to be awarded APEL (C). 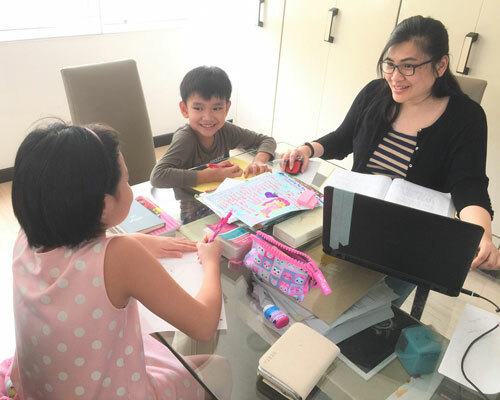 Lai Chai Gim, Current INTI MBA Learning Simplified student, completes her assignments at home with her children. Current INTI MBA Learning Simplified student Lai Chai Gim was the first student at INTI to be awarded APEL (C) after she applied for the two-year MBA Simplified Learning through APEL. Lai joined the workforce after her diploma to be financially independent as she did not want to burden her parents with paying for her further education. Now she views being able to pursue and complete the higher education that she left behind years ago as a personal accomplishment. “Preparing my portfolio for the APEL (C) assessment really helped me to document my skills and put into perspective the knowledge my years of experience have equipped me with. After all, our work experience and exposure is ingrained within us. The application process for APEL (C) merely reviews what we already know. “Lai said. APEL (C) is currently applicable for INTI’s MBA programme in collaboration with University of Hertfordshire and MBA Learning Simplified with intakes commencing 10 June, 19 August and October 28.